One of SERVPRO of West Palm Beach’s well known qualities amongst our customers is our diligence. Regardless of the cause of damage, our evaluations are extremely thorough. Our experienced crew ensures that they look beyond the evident damage. For instance, our team might be assessing water damage in a home, with the obvious signs of water in the carpet. Equipped with thermal imaging tools, we look beyond the carpet, in the walls, ceilings, and other belongings in the area. In another situation, we may find mold damage that was not our original reason for visiting a home or business. Proper inspection includes looking beyond what is evident, for other current damage or identifying future sources of damage. Our team is happy to take the additional time and steps to ensure our customers do not endure any more hardships whether to their home or business. We understand the stress that may come when you are in need of restoration services, so we do our best to leave you with repaired damage, peace of mind, and satisfaction. Our team’s patience and attentiveness does not end with assessments. Restoration and remediation services tend to be confusing for many customers. There are many questions concerning the length of time, the cost, what will happen to belongings, etc. Our team does our best to educate our customers through each step, reassuring them of the care we will take with their belongings and home. When working with a restoration services company, consider the company's reputation for being diligent. Being thorough when it comes to fire, mold, or water damage may help to save you time, money, and prevention from future disasters. Does Your Business Have an Emergency Ready Plan? Depending on the industry a business is in, and the size of the business, there may be contingency plans in place for different situations. A bank may have a plan in the case of a robbery; a big corporation may also have a plan in the sudden case that a C-suite executive resigns. As research has indicated, also having a plan in the case flood, fire, or water disaster strikes is essential for businesses to remain open. Loss of revenue, quality of customer service, and additional expenses all accompany business interruptions. As every owner knows ensuring a company remains functioning as normal is vital to the longevity and success of your business. SERVPRO's Emergency Ready Plan (ERP) helps business owners develop a guide that they can spring into action upon a moment’s notice. SERVPRO’s ERP is a cost-free tool that any company can easily utilize in the case it is warranted. Building a profile is simple with the ERP app, allowing all data to be easily stored and synced to as many devices of choosing. After registering for an account, users can create profiles for all of their properties. A walk-through of any property or facility is the first step. Our field form allows a user to easily log all critical information necessary in the event of an emergency situation. Having this information handy and stored also helps to streamline the restoration process while substituting the need for important documents, should they become damaged in a disastrous event. The distribution of the ERP to key decision makers is simplified with the app also. Sharing the plan with leaders in your company and your preferred local SERVPRO, mitigates the possibility of any miscommunication or confusion. Should your business endure any damage, an option and process for help are already in place to execute. The choice to contact your preferred local SERVPRO via phone call or notice of loss form is available via the app. Since information on your property has been provided already to your local SERVPRO, most of the extensive questioning has been taken care of, allowing our crew to begin working much more quickly. Every owner desires a peace of mind when it comes to their business. Employee and customer happiness is a top priority as is the bottom line. Ensuring contingency plans are in place helps to reinforce those priorities. With SERVPRO’s Emergency Ready Plan, your business is back on it’s feet sooner after an emergency disaster. Call SERVPRO of West Palm Beach to ask about the ERP for your business and even your home. Our representatives can provide you the necessary information and direction toward making sure your business is ready for anything that comes your way! SERVPRO of West Palm Beach is located in the heart of West Palm Beach, extending our services out to Royal Palm Beach, Palm Beach Gardens, Wellington, Loxahatchee and more. Our franchise operates seamlessly, utilizing our skills and crew to provide our customers with the best possible restoration services. Our team advocates for continuous education in the restoration industry. Many of our crew members strive to complete new certifications and refresh their knowledge on previously obtained certifications as well. We connect with other industry leaders, both local and national, to ensure we are offering our customers the most innovative and current techniques and equipment. We have the ability to take on larger commercial projects with ease while maintaining the level of work we provide for our residential customers. 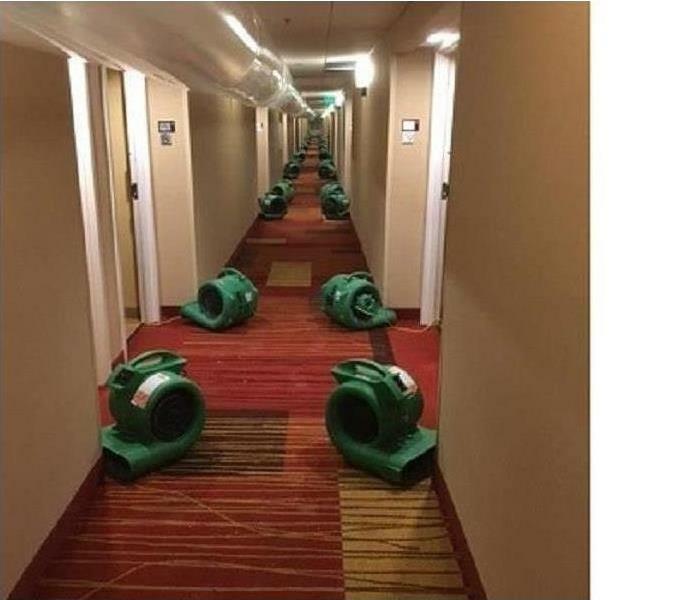 One project may require drying and cleaning a flooded hotel in downtown West Palm and another removing mold-ridden carpet in a Palm Beach home. Working differing situations comes easily for our crew as they are confident in their skills and ability to adapt. We pride ourselves in taking the time to know our customers and not just their emergency disaster at hand. Familiarizing ourselves with each individual customer allows us to understand what is important and what expectations there may be, aside from providing excellent service. As business owners and homeowners, we understand that the notion of flood, fire, water, or storm damage can be overwhelming. Our crew walks each of our customers, commercial or residential, helping to ease feelings of worry and unrest. Our customers trusting us is our top priority. Your backyard is ours as well. We take pride in working and living in Palm Beach County. Our entire crew is involved in the Palm Beach community through volunteering, donating, or mentoring. We have felt the affects of a hurricane and damage caused. We understand the stress with a fire or mold disaster. We want our neighbors to live worry-free with their homes at preloss conditions. We support the community just as much as they support us. If you are experiencing any damage to your home and are in need of restoration services, call SERVPRO of West Palm Beach. We are dependable, trustworthy, and provide nothing less than quality work. You may experience a small water leak or flooding in your Palm Beach home and with a few Google searches or YouTube videos later, you’re convinced to DIY the situation. Often, some sites may provide water damage restoration tips, giving homeowners the confidence to attempt restoration and cleaning. While these tips mean well, DIYing water disasters can lead to other issues concerning your health, safety, and home. Before starting any restoration consider the following reasons. The source of water leaks or flooding can have a direct effect on someone’s health should they come into contact with sitting water. There are different classifications of water including clean, gray, and black water. These classifications are not labeled relative to the color of the water but rather the contaminants found, usually stemming from the source. Microorganisms from the water and any lingering bacteria after an improper cleaning can be detrimental to personal health. Certified professionals in the restoration industry have had the experience and training to identify obvious, hidden, and potentially future damage. Surface level damage, such as wet walls or flooring is easily recognized. Affected areas can be deeper than what is seen by the untrained eye. Water can make its way under multiple layers of dry wall or flooring. Other issues like mold or mildew can spur from not properly diagnosing damage. A professional understands where to look and what to do to mitigate any present or future loss. The average homeowner more than likely does not own the equipment necessary to dry, clean, and restore water damage. Industry-standard air movers, dryers, and dehumidifiers require proper knowledge on use and placement. Tools for restoration also include cleaning solutions that rid of any bacteria, odor, or residue. These solutions may require extensive training on using them including safety equipment that a homeowner may not otherwise think of obtaining. If needed, building materials for replacing drywall or flooring are easily found in hardware stores. However, unless a homeowner is a professional contractor, these items are not simply laid down with a few nails or adhesives. Restoration companies that offer rebuild know how to effectively and quickly replace damaged drywall, flooring, or other structural components in a home. Many homeowners are under the impression that they will save money but they do not always factor in time. Water damage restoration jobs entail a number of issues that require more than one set of hands. A professional crew has the ability to keep projects within a shorter timeframe than one person may be able to do. With a crew, believe it or not, both time and money are saved. Restoration companies know exactly what needs to be done, the timeline in which it can be done, and what equipment to use. Professionals also know how to complete restoration without making any mistakes that a homeowner might, costing additional monies. When it comes to water damage and restoration, DIY is not the best route for any Palm Beach homeowner. Call a professional restoration company to save your health, your time, and your money. Your house is not a home without your valued belongings. Many items in our homes hold fond memories of our families and friends. Some items we have worked hard to obtain and are filled with a sense of pride when regarding them in conversation or using them day to day. Whatever the feeling may be when it comes to furniture, clothes, photos, trinkets, and more, there is an overwhelming feeling of sadness once these items become damaged or lost. When a fire or flood strikes your home, the question “What will happen to my home?” crosses a homeowner’s mind first. The second question may be “What will become of all of my things?”. As restoration experts with many years in the industry, we have seen a number of situations where disaster occurs, and homes are inundated with damage. Even in the direst of conditions, our crew has extensive experience in content restoration, to help salvage your valuables. Content restoration happens when belongings are affected by fire, water, or mold. During the cleaning phase, our crew may “pack out” the items in any areas where damage occurred. Allowing the SERVPRO crew to pack your items ensures a more streamlined process and protection from further harm. We also help to inventory your belongings and document anything moving in or out of your home. Keeping a list also aids in any insurance claims that potentially occur later in the process. These items are brought to an area in which our team can diligently inspect them to determine if there is a chance of salvation. Our mentality is “restore” rather than “replace”. Restoring items saves many homeowners memories and money. Once items are categorized, cleaning or drying begins. Depending on the source and extent of damage, there are different methods utilized to carry out cleaning. Documents, photographs, and electronics are handled in a different matter than fabric and clothes may be. Our crew is qualified to determine which technique and level of cleaning is needed. Being tentative and knowledgeable is imperative to keep each item intact. Following your home’s restoration, our team will work with you on your move-in needs. In the case that your home is disturbed by a disastrous event such as flood or fire, rest easily knowing that your valuables, along with your home, are not completely lost. Our team understands the memories our customers have made in their homes. We strive to help you keep your belongings and bring your life back on track, "Like it never even happened." Fire and water emergencies can bring homeowners many checklists, worries, and questions. The question of whether they will have to replace all clothing and textile items may plague many homeowners. During the process of cleaning and restoring, personal items and valuables are sorted to determine what is salvageable and what is not. Cleaning salvageable items is a part of the restoration process. Clothes and textiles affected by water, mold, soot or fire smoke can be restored with our Esporta machine. Traditional washing machines, home-owned or industrial, do not have the capability to properly clean water, mold, or fire damaged clothing. The Esporta Washing System cleans twice as much than a dry cleaner can. The Esporta cleans 90% of all damaged soft contents including clothing, bedding, stuffed animals, leather shoes or purses, and more. The Esporta Washing System uses a hydraulic cleaning method. This method uses water as pressure to force contaminants out of any items. This system differs from a traditional washing machine, as a traditional machine uses blades or paddles to press against the items, proving to be ineffective against organic or inorganic contaminants. The detergent used in the cleaning process is also what sets this washing system apart from other methods. The proprietary detergent is harsh on contaminants but gentle on the environment. The blend is free of any hazardous chemicals, proving to be kind to those using the washed items, anyone operating the machine, and to our planet. SERVPRO of West Palm Beach is one of the Esporta Certified Operators within Palm Beach County, including West Palm Beach, Royal Palm Beach, and Wellington. Accessibility to the Esporta gives us an edge on our competitors in providing quick, quality service and ensuring as much of our customer’s contents are restored. Restoring and cleaning your salvageable items usually helps to expedite the process of dealing with an insurance claim and returning back to your normal life. SERVPRO of West Palm Beach also eases the worries and many steps that comes with a fire or water damage emergency. We offer inspection, cleaning of both buildings and items, along with restoration. For your next fire or water damage emergency, contact the pros at SERVPRO of West Palm Beach. Commercial cleaning is not limited to restoration services after a disaster for the team at SERVPRO of West Palm Beach. Commercial buildings in downtown West Palm Beach undergo extensive use regardless of the related industry. Many businesses use janitorial staff for surface cleaning like vacuuming or wiping down a restroom, but there is more cleaning to be done. Deep cleaning of carpets, walls, air ducts and more, are not services business or building owners always have as top-of-mind. Choosing a commercial cleaning service can be difficult as you are entrusting your business’s appearance to someone else. One determining factor to look for is the extent of services offered by the cleaning and restoration company. Heavy trafficked areas can leave carpets with built-up soil that can become unsightly. Carpets tend to trap dust, dirt, and other bacteria, creating a potentially unhealthy environment for those walking and exposing the area to the kicked-up soil. Our routine professional service relies on a few methods to maintain carpets and upholstery. Bonnet Cleaning, preconditioning and rinsing, as well as dry cleaning, are all gentler ways of getting deep to the dirt. Hot water extraction along with our Showcase Premier cleaning allows for targeting tougher areas. Similar to carpet, floors endure high traffic and grime buildup. Sweeping and mopping are sufficient for surface cleaning but are not always adequate in removing dirt that has amassed over time. We tackle tile and hardwood, safely sanitizing the surface and grout with equipment used for heavy duty jobs no matter the area. Walls and ceilings are just as susceptible to dirt as carpets and floors. Walls collect dirt from touch, smoke, grease, and any other substance your HVAC system might distribute. Cleaning walls without ruining the paint or finishing can be tasking for a janitorial company. SERVPRO of West Palm Beach uses proprietary cleaning products to thoroughly and safely clean ceilings or walls. Outdoor air quality is a concern for many people as we are exposed to pollen and air pollution. Indoor quality should be just as big of a concern. Employees in commercial buildings spend a majority of their day indoors and should have access to dust-free, pollen-free, mold-free, clean air. HVAC’s and air ducts often are ignored when routine maintenance is performed. Ventilation system cleaning is not only necessary to maintain the proper air quality but to ensure proper functioning of these systems, extending the life of the equipment. Our team has the experience and knowledge to inspect a commercial building or offices’ ducts to determine the extent of cleaning needed. Does your building or office space have a certain smell that lingers? Restaurants and hotels are often inundated with different smells left from cooked food or the various visitors. Other buildings could potentially have a chemical smell, mold smell, or just a stale, stuffy odor. Odor issues stem from a source, caused by a past event or a current problem. Our team carries out thorough inspections to ensure that the source of the smell is not an issue in need of resolving or causing detriment to the building structure. Our methods don’t just mask the smell temporarily; we locate the source and penetrate the surfaces to extract and stop any foul odors. Along with these services our team also offers other commercial cleaning including: biohazard cleanup, sewage and toilet overflow, mold and water cleanup. From restaurants and hotels, to warehouse and office space, SERVPRO of West Palm Beach understands the importance of providing a clean, safe space for your team and customers alike. Call today to begin commercial cleaning services for your downtown West Palm Beach building, 561-795-5410. West Palm Beach’s downtown district offers a variety of businesses, in many different industries. Just as ample as the number of businesses are the number of commercial cleaning and restoration services. When a disaster hits, some business owners are keen on contacting the first company that they encounter, in a bout of urgency. However, entrusting your business to just any commercial restoration service can turn into a more expensive and damaging job. All restoration companies are not created equal. In fact, there are a number of factors to consider when conducting research. Company biographies and employee pages are not on a website just for cosmetic purposes. Reading into a company, its owner, and crew, provides insight that a simple ad may not have otherwise provided. Company pages in the restoration industry should list any certifications and years of experience. Even if is it not clear as to what a certain certification may mean, knowing that is listed shows that it is important and that the owner’s care enough for their customers to invest into their employees training. When years of experience are provided, whether for individual employees or for the company as a whole, this showcases the extensive knowledge and on-the-job practice gained. Scanning reviews on the website or third-party pages including Google My Business and social media, gives a sense of customer sentiment. A company with positive reviews generally has a reputation for providing quality work and meeting expectations. Reading through reviews and a company’s response to these reviews can help to reinforce a decision. Be weary of negative comments however. Reading into the negative reviews that seem genuine is suggested as there is typically a reason for the low rating. However, use your own judgment when reading both the positive and negative reviews. An emergency disaster requiring restoration services usually falls within fire, water, or mold. Of course, there are other situations that call for a restoration company also. Reviewing the website for services offered and details on each service is imperative during the research phase. Some companies are subject matter experts for one or two services, while others are multifaceted and have a wide range of capabilities. Companies that offer assessment, cleaning, restoration, and rebuild are ideal as they provide a more streamlined experience. Stay sharp as to whether not a company over promises or seems as though they are providing a false sense of reality. Most companies are available 24/7 and should walk through expectations and timelines upon first contact. Accidental or emergency disasters require a company who can adapt to a business including the time in which a business may need to be fully functioning and any intricacies that come along with a project. A hotel job site could require expedited timelines while a car dealership may afford to stay closed a bit longer as the level of work needed is more complex. A company may not always have photos of all of their commercial clients for legal reasons, however, asking about the company’s experience is a simple way to gain an understanding of the extent of work they’ve done within a specific industry. Making a decision on a restoration services company goes beyond listing offerings or past projects. Employees should display professionalism, courtesy, kindness, and understanding through this difficult, confusing time. Conversations should center on openness and candidacy. Companies that provide positive interactions from the beginning to the end of an emergency disaster are those that also offer quality service. Entrust your business to a professional, reputable company, who has the experience and ability to get your business running as soon as possible after a flood, fire, or mold disaster. In two minutes, a Wellington house fire can become life threatening. Fire can turn from a small flame to a major fire within less than 30 seconds. Smoke and toxic gasses travel and affect any inhabitants of the home just as quickly. The color of a fire can turn from a bright flame to thick, dark smoke obscuring any sense of vision. These facts are not meant to frighten but are meant to raise awareness. Understanding how fast fire affects a space and the varying damage it creates, is crucial to staying vigilant. Being cognizant of the top 5 fire causes can minimize the risk of home fires. In 2016, cooking made up for just a little over 50% of U.S. residential fires. It’s no surprise that this is the main driver, when the kitchen holds so many items and incidences that can spark a fire. From frying, boiling, grilling to small grease fires, even accidentally leaving the oven or stove on for too long, fires are imminent without proper precautions. Staying alert while cooking, removing distractions and preparing a workspace free of anything particularly flammable can greatly lessen the changes of a cooking fire. While South Florida is not known for its winter months often dropping to temperatures below freezing, there are a few days in the year where it does get uncomfortably cold for native Floridians. Most homes are equipped with central air and heat, there are instances where a space heater, portable or stationary, is utilized. Space heaters too close to items that easily catch fire, like furniture for example, are the leading contributor in starting fires. Improper cleaning of heating devices, whether it is a fireplace or heating system, has also led to 27% of heating related fires. Wiring, appliances, even lightbulbs can be the root cause of electrical fires. Your Wellington home is full of wires for your major appliances, TVs, lighting, and more. Faulty, outdated or broken wires can set off a spark or two. Even laying rugs or other materials over or directly on top of wires can cause potential fires. Lighting is not just limited to the wires producing the light. Lightbulbs installed with a wattage that is too high for the fixture can trigger a fire. As romantic as it seems, laying material over a lampshade or light fixture often results in fire as well. Between 2012-2016, 23 candle related fires were reported per day. That number may seem a bit high for an item that typically has a contained flame and does not take up much space. Lighting a candle or two can be relaxing, however, fires triggered by candles have been due to a homeowner’s leaving the candle unattended. A burning candle through the night or a candle too close to a flammable object have been reported during such incidents. Using candles does not have to induce fear, there are plenty of tips on how to safely use candles in your home, including staying aware. Smoking materials are the leading cause of fire deaths among all other events. Fires stemming from smoking are not limited to cigars or cigarettes. Fires associated with E-cigarettes have been from battery failure while the battery was being charged or transported. Whether it is a cigarette, pipe, or e-cigarette involved, users should take caution to properly store and use these items. Smoking outside, proper storage and discard of smoking materials help to reduce the number of fires and fire related deaths. Distraction and carelessness are the root of many fires unfortunately. While some incidents are out of the control of any one person involved, many fires are preventable. Performing due diligence when it comes to everyday tasks or the upkeep of your home is vital to avoid a fire and the long-lasting damage it can cause to your Wellington home. Florida residents have experienced tornadoes, flooding, tropical storms and hurricanes with more storms hitting the state than any other. As all of Florida, especially South Florida has been affected by a hurricane or major storm, no area is immune to storm damage. Some Floridians have experienced a storm shutter or two missing, even storm water flooding their homes. With each hurricane season, comes an array of surprises, some worse than others. Let’s take a look at some of the worst hurricanes and the damage they have caused over the years. This hurricane was one of the most devastating hurricanes recorded for Palm Beach. This storm made landfall with winds of up to 145 mph, destroying over one thousand homes. Many people were affected greatly by this storm, sadly losing their lives, along with millions of dollars in structural damage. This hurricane, subsequent to the Miami Hurricane of 1926, proved to officials that buildings that were properly built and secured remained intact while those not made of steel or concrete were severely damaged. While the aftermath of Okeechobee Hurricane or the San Felipe Segundo Hurricane was vast and costly, it did bring a positive effect on building codes. 1947 brought two major hurricanes and various tropical storms causing significant devastation. In September 1947, a Category 4 Hurricane caused storm surge of up to 22 feet near Lake Okeechobee and 11 feet by Palm Beach and Boynton Beach. Many houses and buildings on the east coast were hit hard by waves and flooding, forcing many residents to flee their homes or seek higher ground. Structures abiding by improved codes fared well, while other older buildings were impacted with no hope of rebuilding. One of the final hurricanes for that season, dropped inches of rain on South Florida, causing major flooding in the Miami-Dade county. This hurricane was one of the first that experienced government involvement, with attempts to drop dry ice to weaken the storm. These attempts were unsuccessful. The flooding from this hurricane was the worst recorded in South Florida so far with over eight feet of water in some areas and many houses nearly submerged. Hurricane David was one of the next major hurricanes after about 20 years of relatively quiet seasons. Following the losses in the 1940s, David hit Florida as a Category 1 hurricane, bringing only two to four feet of storm surge along with it. Damages from this hurricane were minimal, with crop damage accounting for the majority of millions Palm Beach County lost. Even so, some resident’s failed to prepare, allowing blown in windows and torn roofs. Hurricane Irene was one of the first hurricanes to remind South Florida residents of the 1940s. Rain of over 17 inches generating over $600 million in flooding and agricultural damage. Four tornadoes tore their way through Broward and Palm Beach County producing more damage and casualties. Hurricane Wilma was one of the strongest hurricanes seen so far, resulting in over 6 million Floridians without power, even though it hit Palm Beach County as a Category 2 hurricane. Lights and power lines scattered the streets, roofs were torn off and a mandated curfew of 9 p.m was put into place as the amassed $20.6 billion destruction of Wilma plagued South Florida. After years of quieter hurricane seasons, sprinkled with a few tropical storms in between, Florida experienced Hurricane Irma. Prior to Irma, a Category 4 hurricane, Hurricane Hermine had made landfall the year prior causing river swelling. Irma proved to be a much stronger storm in terms of windspeed and pressure. Irma left behind over $50 billion in damage, higher than that of Wilma. Over 6.5 million Floridians were ordered to evacuate and the state saw just that exact record-breaking number of evacuees. Many homes and business were damages with more than 24,00 homes experiencing some form of damage. No matter the expected intensity of an upcoming hurricane season, it is imperative that Palm Beach County residents prepare themselves for worst-case scenarios. Always ensure your home or business has a contingency plan for before and after a storm. If your home experiences storm damage inflicted by a major hurricane or tropical storm, be sure to call the professionals of SERVPRO of West Palm Beach to help with any flooding, leaks, water or mold damage. 4/9/2019 - Does Your Business Have an Emergency Ready Plan? 3/31/2019 - What is Content Restoration?